The steampunk spider from Wild Wild West is arguably the most memorable part of an otherwise forgettable movie. 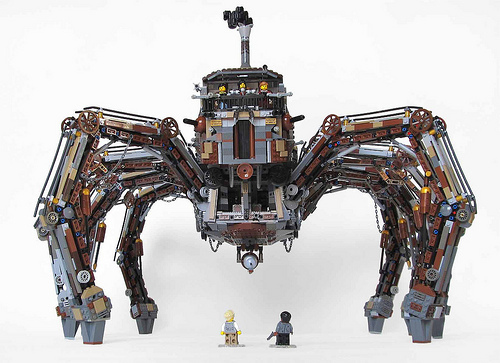 Leave it to none other than Imagine Rigney to render it in Lego to add to his collection of gigantic Lego creatures. Check out more photos in the builder’s Flickr set. Haha awesome Imagine! You are the master of large creature-y builds and this one does not disappoint! It’s a pity the film wasn’t half as great as this MOC! What an enormous treat for me. I’ve always wanted to see this monstrosity built in Lego and this MoC really hit all of the details so well. Great work.